November’s Clandestine Cake Club challenge for the York group was enough to tempt me back into the fold. The challenge was to produce a vegan AND gluten free cake. Well, I couldn’t pass up on that kind of fun, could I? 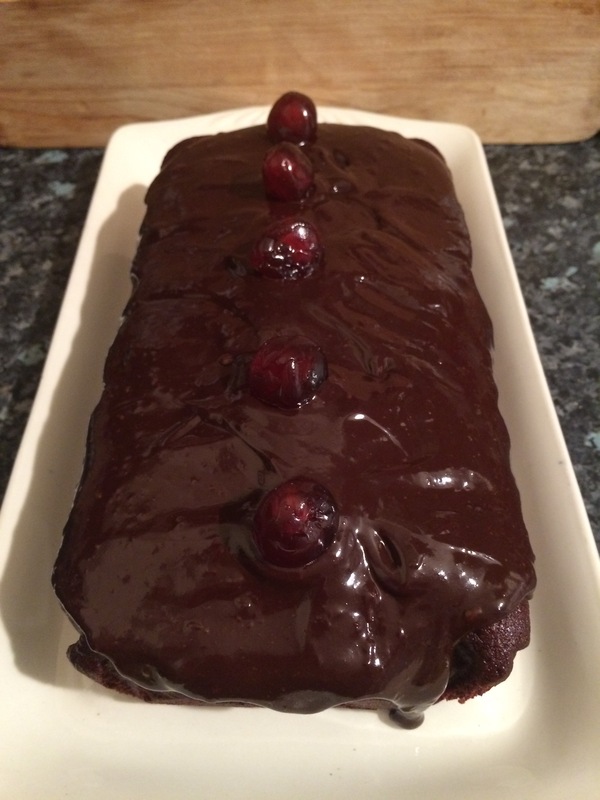 I chose to go for a chocolate cherry cake… because YUM! But you could really take this cake in any number for directions for a scrumptious, vegan, gluten free, packed full of flavour, moist and delicious cake! It is equally at home being a loaf or a layer cake. Whether you are after something for a celebration or just a little something to serve with tea. So often I find the texture of gluten free cakes to be lacking. There’s something just not right about them. 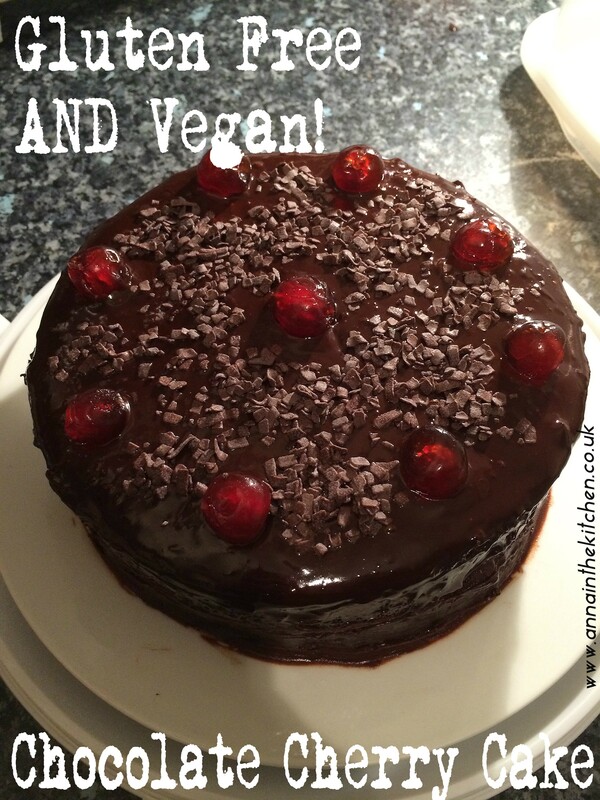 However, this cake proves that not only does it not have to be that way but that you can make a quick, easy, fuss free gluten free AND vegan cake without making any sacrifices at all! What’s not to like about that?!?! – In a large mixing bowl combine the flour mix, the almonds, the sugar, cocoa powder and baking powder. – In a small saucepan heat together the milk, fat and syrup until all melted. – Pour the wet ingredients into the dry and stir well to combine into a smooth batter. – Test with a skewer to check if it is done in the middle. If the skewer comes out clean then place it on a wore rack to cool, otherwise pop it back in for another 5-10 minutes. – To make the icing melt the chocolate in a microwave proof bowl. 30 seconds, stir it, then another 20 seconds work for my microwave but they are all different so go slowly in short bursts, checking and stirring regularly. Alternatively you can place the bowl over a pan of boiling water until the chocolate melts. – Pour in the milk and mix vigorously to combine into a smooth ganache. – When your cakes are cool spread jam in the centre if using, then ice the top with the ganache and decorate with cherries and sprinkles! I think that I’m rather beginning to get into the swing of Fast Day recipes now! The temptation at the beginning was to just keep it simple and stick to basics. You can’t really mess up a grilled chicken breast and a plate of steamed veg, can you? But that got boring, fast. I like to look forward to my dinner, especially when I have to look forward to it all day without even the blip of lunch to see me through. So I’ve been playing around with some fancier options recently. This dish is still simple, and it does essentially comprise a plate full of chicken and vegetables. But presentation is everything! You eat with your eyes first, after all. By stir frying you get a different texture and the cauliflower ‘rice’ adds a visual appeal and a satisfaction that I just don’t feel you would get if you just added cauliflower into the stir fry. The crunchiness of the baby corn and sugar snap peas is incredibly welcome after a day’s abstinence and the punch that you can pack into what boils down to the simplest of sauces gives you a lot of flavour for very little! The other nice bonus is that this is a proper plate full of food. You certainly can’t feel deprived looking at that! – Place the grated cauliflower in a microwave safe bowl and add a pinch of five spice and a pinch of salt. – Stir well and add 1 tbsp water. – Microwave for 2 minutes on full power. – Add the chicken and cook until just browned. 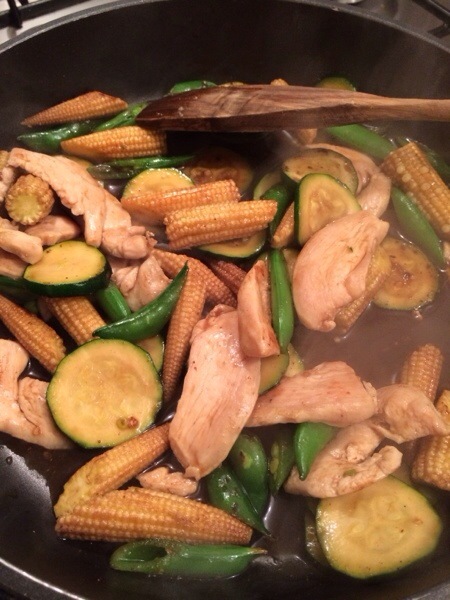 – Add the remaning five spice and the courgette, corn and peas. 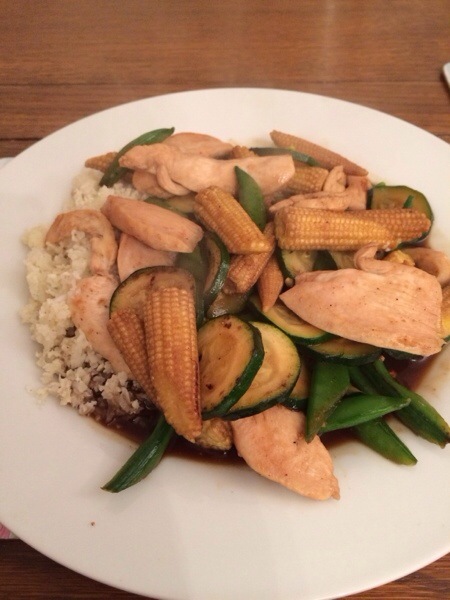 – Stir fry until the courgette is just starting to soften and is catching a little colour. – Add the soy sace, oyster sauce and just a dash of boiling water. Just enough to cover the base of the pan. If you add too much, simply boil until the sauce is reduced. – Make sure everything is coated in sauce by stiring well then serve with your cauliflower “rice”. NB. If you want to make this gluten free make sure you have the right soy and oyster sauces! 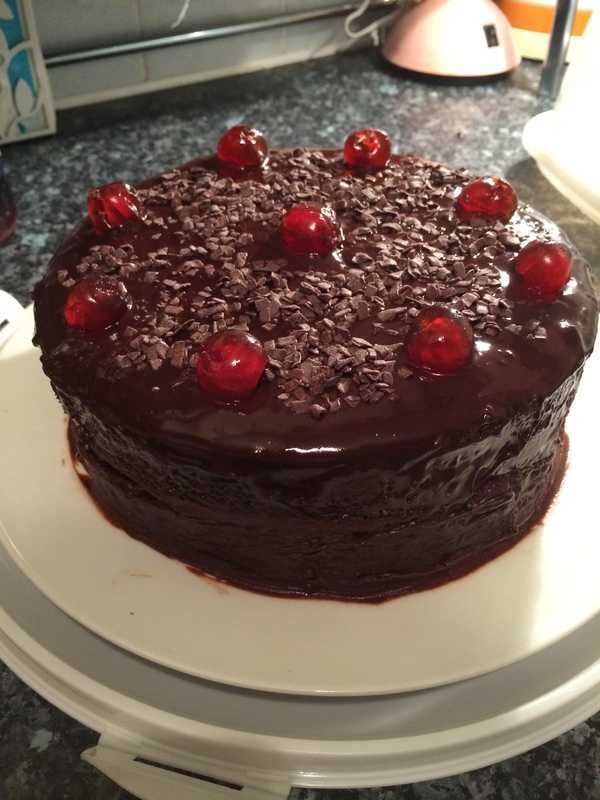 This Chocolate Rapeseed Oil Cake recipe was the result of a Clandestine Cake Club challenge. The theme was Blind Date. You had to bake a cake you had never baked or tasted before. Now, this was a challenge in a lot of ways. First, if I haven’t tasted a cake before it’s because I don’t think I’m going to like it. Why would I bake something I won’t like? Second, I like to have something reliable when baking for others. I want to know how the recipe is going to work and what tweaks I might need to make to have something I’ll be proud of. With this challenge I really was flying blind! I hit upon Nigella’s Chocolate Olive Oil Cake because she happend to have tweeted about it around that time. I like chocolate but I had never tasted an olive oil based cake before. However, there was the small issue that I don’t like olives. I use olive oil all the time in cooking where I’ll never taste the oliveyness but I felt that this was one of those times where it would make a difference. I happened to have a bottle of Yorkshire Rapeseed Oil just begging to be used. I love the nutty flavour of rapeseed oil, it’s just gorgeous, and I thought this would compliment the almonds nicely. I was right, it gives a gorgeous nutty flavour and really gives another dimension to the cake. I’m really keen on trying to use this oil in more cooking in the future. I think it has a lot of potential! The end result is a gorgeous nutty, moist, brownie like cake which would be a perfect dinner party dessert cake. (Imagine it piled up with raspberries or other summer fruits and served with lashings of whipped cream if you will!) However, it also held its own as a simple cake without any adornment. The rich chocolateyness of the cake means it really doesn’t need any help to be delicious and the decadent squidgy texture will certainly have you coming back for more! – Heat the oven to gas mark 5/190C and grease and line a 23cm springform cake tin. – Put the cocoa powder in a mug then pour over the boiling water and the vanilla. Mix together until you get a delicious looking chocolaty paste (don’t taste it, it’ll be gross!) Leave to cool while you do the rest. – Mix the almonds, salt and bicarb together in a small bowl. – In a large mixing bowl combine the eggs, sugar and rapeseed oil. – Use a handheld electric whisk to beat the sugar, eggs and oil until plae and thick. – Add the cocoa paste to this mixture and beat in. – Add the almond mixture and gently fold in until everything is totally combined. – Pour the mixture intot he prepared tin and bake int he centre of the oven for 45-50 minutes. It should look just set int he middle and a skewer will come out clean when it is cooked. – Allow it to cook for 10 minutes in the tin then run a sharp knife (I actually always use a thin bone handled knife for this) round the edge fo the cake to loosen it. Then unspring your tin and either leave to cool completely or serve warm with vanilla ice cream.